What is inbound Lead Management? Inbound Lead Management is a combination of software and inbound sales best practices. The best practices are designed to improve the way inbound leads are distributed, nurtured, and worked through a sales channel. Often the reason you are unable to identify problems with your inbound lead management system is because your process is perfect. Many sales managers don’t know what they should be looking for to ensure that a complex set of automated processes are working properly. Today, so many business processes are automated. They’ve been made more efficient and streamlined by the use sales automation technology. With the advance of so much sales technology it becomes difficult to diagnose where the problems might be located. 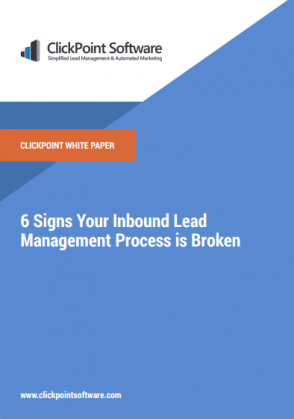 Our guide ‘6 Signs Your Inbound Lead Management Process is Broken’ identifies some of the inherent problems with manual lead management typically found in traditional CRM systems. If you’re only used to seeing lead management as a manual process, then this guide gives you a clearer view, through the lens of automation. You’ll see how automated inbound lead management transforms your ability to bring leads together to get a single view, rate and distribute leads to your call center and field sales agents, and the external networks that many use to service customers. Download the guide ‘6 Signs Your Inbound Lead Management Process is Broken’ for free by clicking here. This entry was posted in Sales Software Best Practices and tagged Lead Management, lead nurturing on March 24, 2015 by Gabriel Buck.